We haven’t done a lot of reviews of laptops for professional workstations suitable for CAD, DCC and CGI applications and there are probably a lot of people out there wondering if it’s really worth spending so much money on NVIDIA Quadro-powered system or should they stick to the mainstream GeForce graphics solutions. 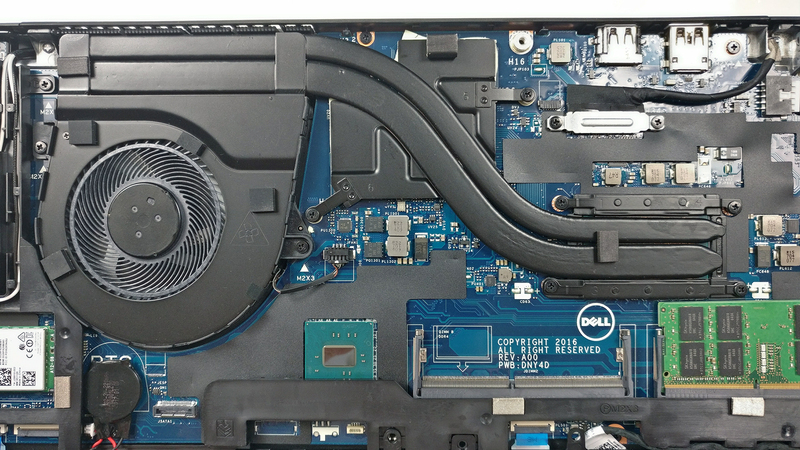 We explore the pros and cons of such laptop, in this case, the Dell Precision 3520, and see what this laptop is capable of. Do you really need to spend so much money for good performance in CAD and DCC software and will the Precision 3520 fit another profile as well? If you don’t know what CAD, DCC and CGI means, then you can skip this review and look for something more mainstream because the Precision 3520 packs some serious power under the hood thanks to the Intel Core i5-7440HQ, which is a slightly more powerful version of the Core i5-7300HQ plus all the Intel vPro features that are essential to some business users, an NVIDIA Quadro M620 (2GB GDDR5) GPU, a big 68Wh battery, 16GB of DDR4-2400 memory and, of course, support for M.2 PCIe NVMe SSDs. Practically, that’s all you need from a mobile workstation but the biggest downside of the laptop remains the screen. Dell has included a washed out Full HD TN display instead of IPS as a default option. Even a budget IPS panel would have been greatly appreciated. 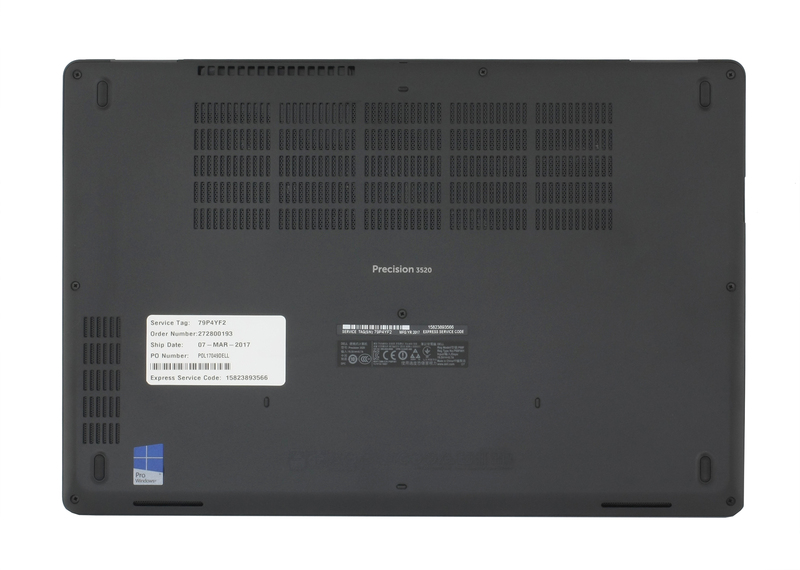 We know that most of the time the laptop will be used with an external monitor but considering the price point of the Precision 3520, it’s still a big miss. Anyway, we grabbed the IPS configuration as we think it might be the most sought after despite being pricier. We honestly think that anyone willing to spend so much money on a high-end mobile workstation like this will also opt for the model with a better display. 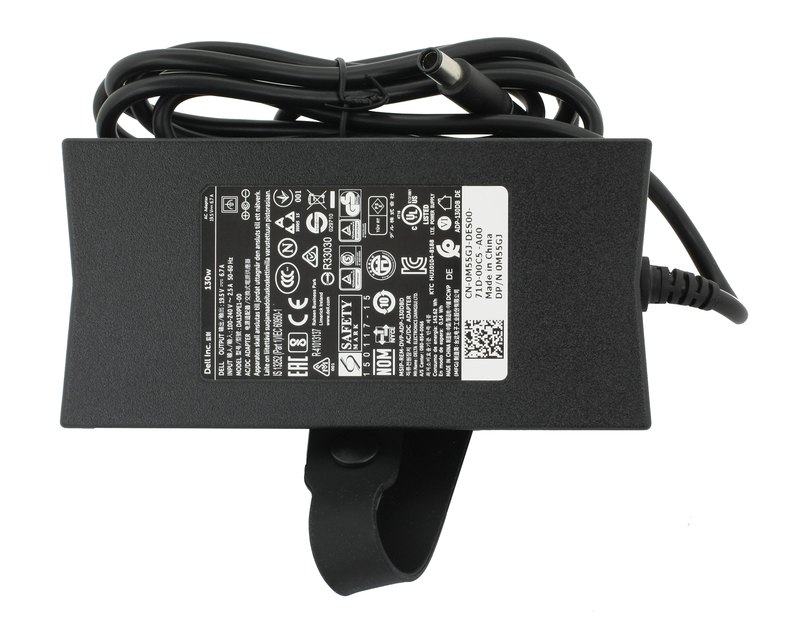 The laptop comes in a standard box containing all the usual user manuals, AC adapter and power cord. 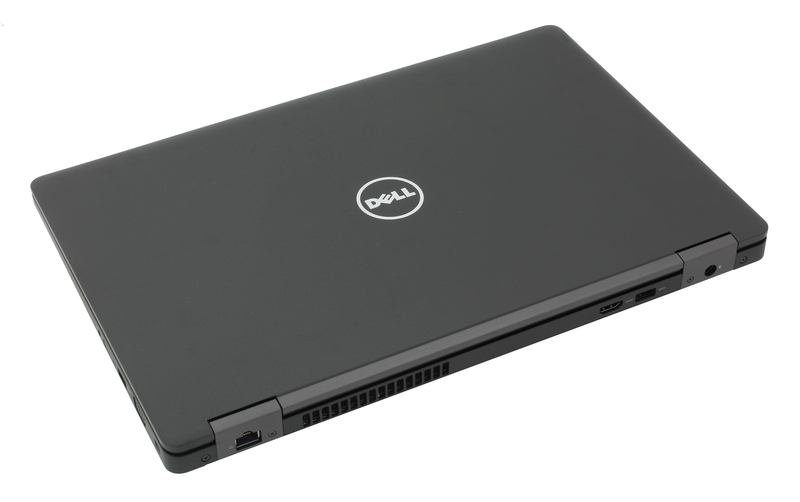 The design of the Precision 3520 is quite similar to the modern Dell Latitude series and it’s understandable. Both lineups fall into the business category and it’s only logical that they share the same design approach. We’ve got strictly black, robust and simplistic chassis with fairly compact dimensions and surprisingly low weight of around 2.23 kg. Let’s start with the lid. It’s made of robust plastic material with a slightly rubberized coating on top providing excellent grip for carrying around but fingerprints and smudges remain visible. 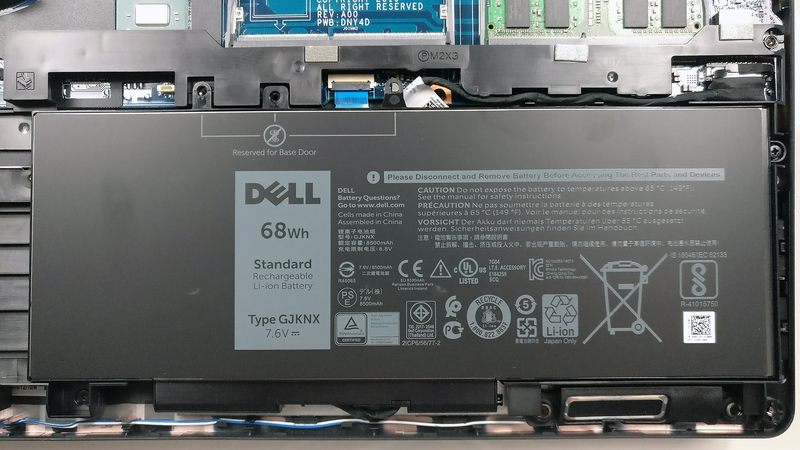 The center of the lid, where Dell’s logo is located, feels a bit flexible only under moderate to high pressure, although the lid isn’t susceptible to twisting and bending and ripples don’t appear on the LCD screen when pushing the back of the lid. It may be due to the well-designed metal hinges leaving no room for rocking and sway. Our only complaint towards the hinges is that they are too tightened and leave no choice but to use both hands when opening the notebook. The bottom retains the rigidity we liked so far but the use of slightly roughened plastic that feels cheap just doesn’t fit the whole profile. Anyway, the relatively thin 25 mm thick sides accommodate all the needed connectors and I/Os. The left side holds the USB Type-C 3.1 connector supporting Thunderbolt 3, the SD card reader and a standard USB 3.0. The right side holds the SIM card tray, a 3.5 mm audio jack, another USB 3.0 port and, quite surprisingly, VGA for an external monitor. It really makes us wonder who is still using a monitor with VGA connectivity but we guess it’s better to have it on a business-centric machine. 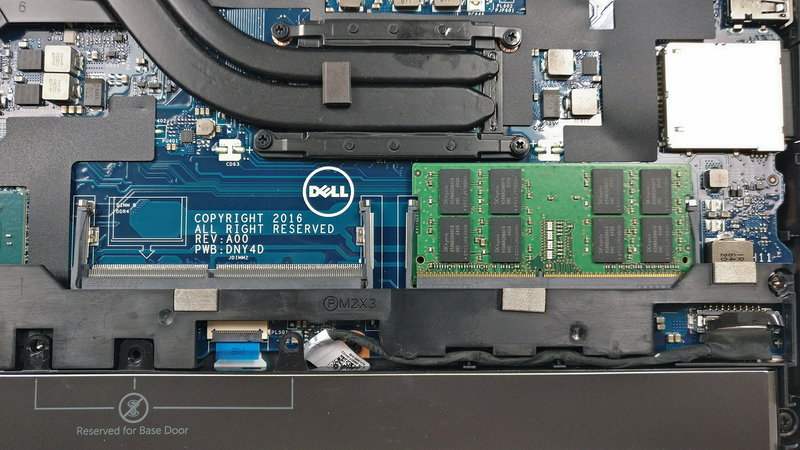 And as we’ve seen in numerous other Dell laptops, some of the connectors are placed on the back so they don’t get in the way when the working space is small. The back holds the RJ-45 for LAN connectivity, an HDMI, another USB 3.0 and the DC charging port. We can definitely say the port distribution is more than good and we doubt that cables will get in the way while working. 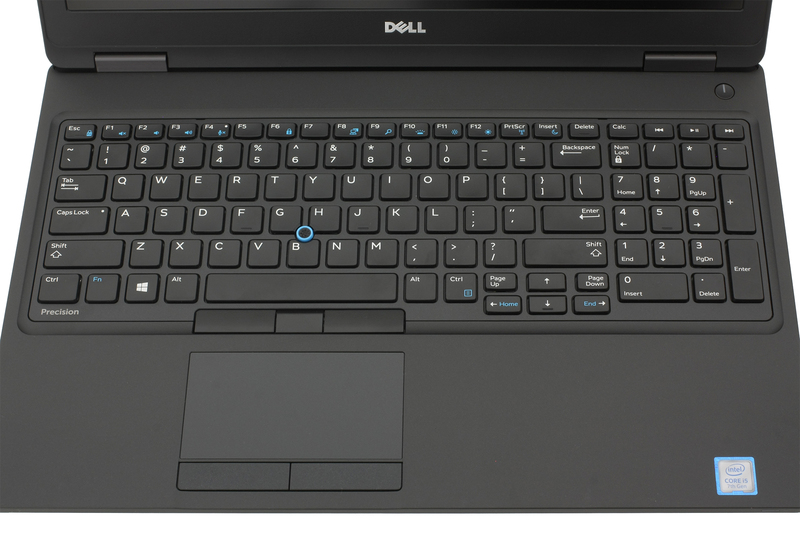 Opening the laptop reveals another well-known aspect of Dell’s high-end business-grade machines – standard keyboard layout with slightly concaved keycaps, well-integrated LED backlight, long key travel and satisfying clicky feedback. In the middle of the keyboard, you will find Dell’s own version of the TrackPoint, which in our opinion, is ergonomically better than the one on the ThinkPads but we didn’t quite like the dedicated mouse buttons. Due to the concaved keyboard tray, the mouse buttons aren’t sticking out enough and it’s hard to feel them with your thumb. If they are protruding more than the edge of the palm rest area, we would have been perfect. The touchpad, on the other hand, is ideal. The gliding surface feels nice, the mouse buttons are well-placed with long travel and nice and soft tactile feedback. While all of this seems great, we did notice something strange about the whole interior. At first glance, the base feels pretty solid but we found some weak spots. For example, the wrist rest area and the surface between the hinges is rock-solid but the center of the keyboard and the spot around the space bar is a bit flexible. It’s strange considering the high price of the product, however, this doesn’t affect the user experience one bit. In the end, the Precision 3520 delivers what we’ve expected from the beginning – robust construction (with few and barely noticeable exceptions), fairly light and portable chassis, simplistic design, excellent keyboard and good touchpad experience. Basically, things you’d normally expect from a high-end business workstation. 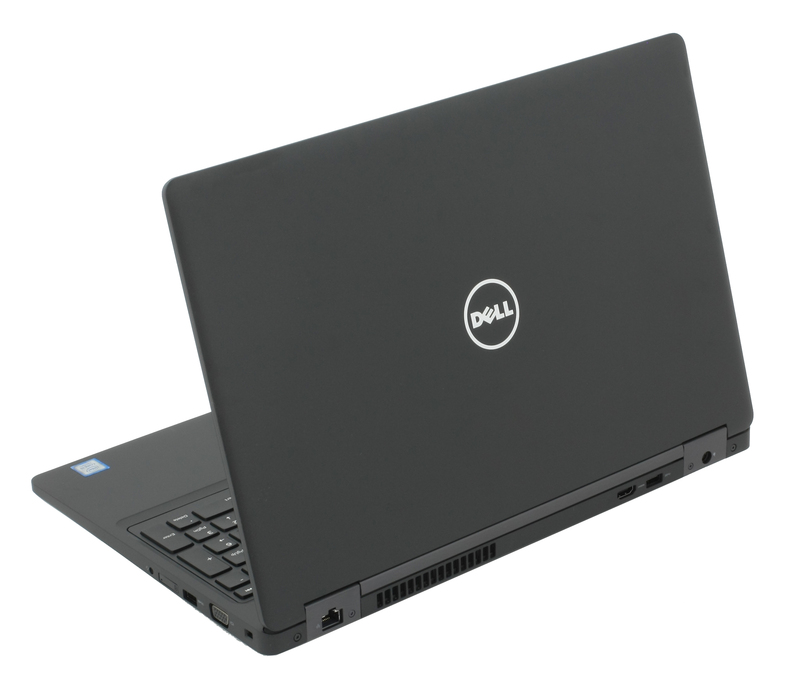 Luckily, the notebook offers a big service lid that gives access to all of the hardware including the cooling system. You can easily change the Wi-Fi card if needed, upgrade the storage and memory as well. Just remove the screws on the bottom and pry up the bottom piece. 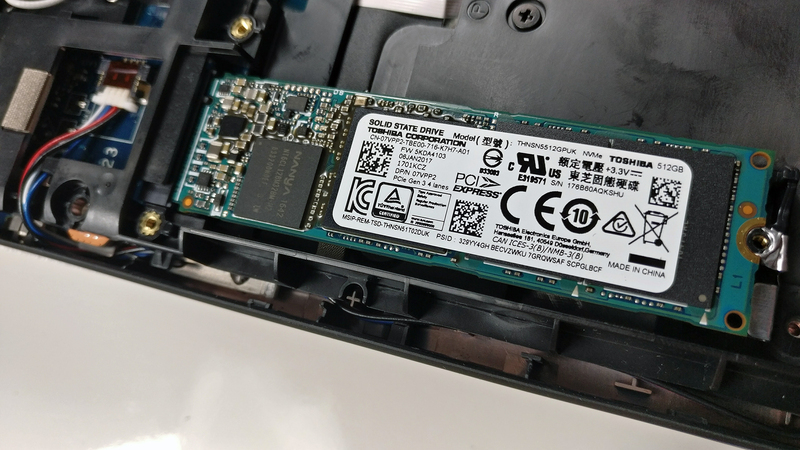 Although the motherboard supports both – an M.2 PCIe NVMe SSD and a standard 2.5-inch HDD, the positioning of the M.2 slot obstructs the 2.5-inch drive and vice versa. This means that your configuration can benefit only from a standard 2.5-inch drive or an M.2 drive at a time. This is a considerable drawback for a number of business users that want the performance of a fast SSD and the big storage the HDD provides. Anyway, our unit came with an M.2 PCIe NVMe Toshiba SSD with 512GB capacity and in 2280 size. The motherboard comes with two RAM slots and in our case one of them was taken by a single 8GB DDR4-2400 chip from SK Hynix. 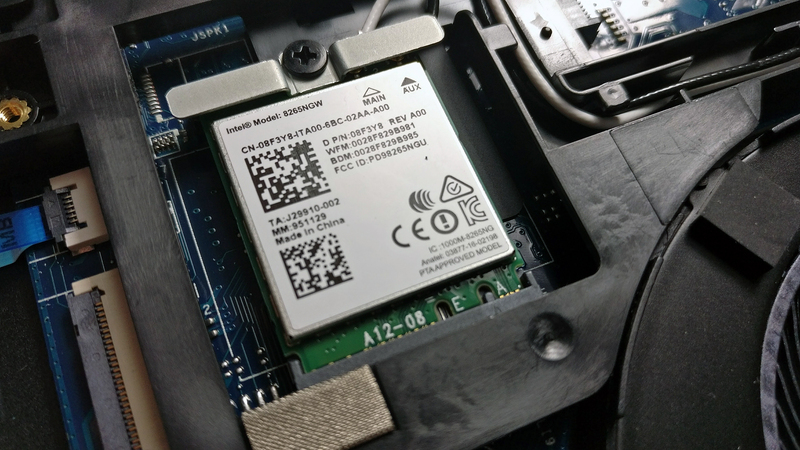 The Wi-Fi card can be found next to the BIOS battery and it’s Intel 8265NGW. The chassis fits a huge 68Wh battery under the wrist rest area, which is the main reason for the great battery runtimes on the Precision 3520. The cooling system consists of a single cooling fan connected via two heat pipes going across the CPU and GPU heatsinks. 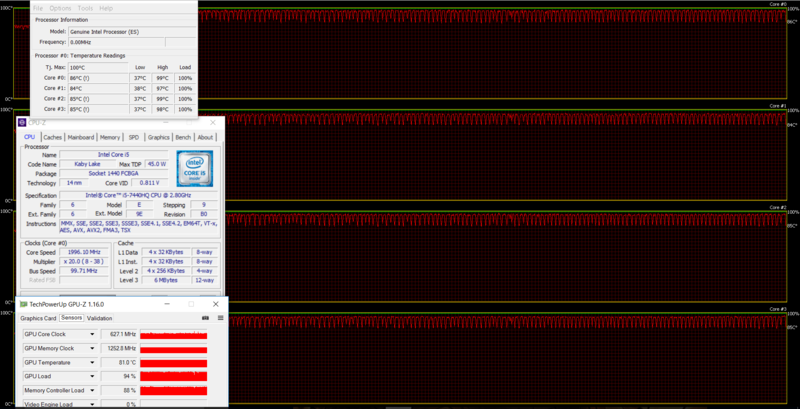 It might be enough for the quad-core 45W CPU but our stress tests show it struggles to keep both, the CPU and GPU, running without throttling under heavy workload. None of the software we used was able to detect the exact model of the IPS panel but judging by the results we got, we are pretty sure it’s the LG LP156WF6-SPP1 manufactured by LG. 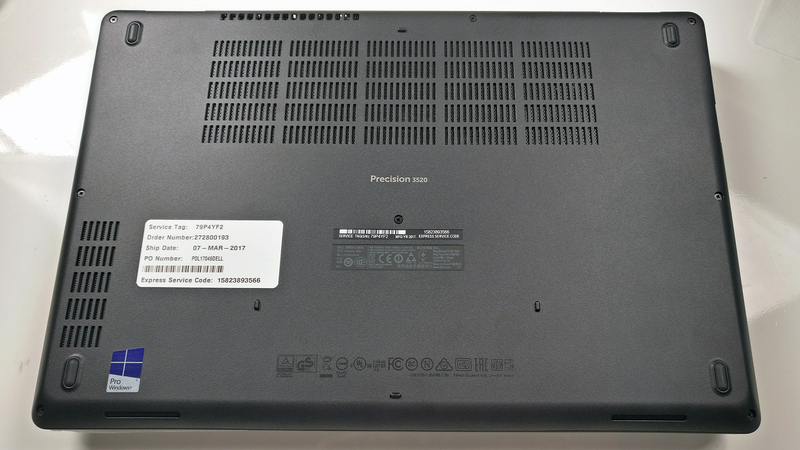 The same panel can be found in the new Acer Predator 15 with GTX 1070. The display has Full HD (1920×1080) resolution, offers 142 ppi pixel density and 0.18 x 0.18 mm pixel pitch. The screen can be considered as “Retina” when viewed from a distance equal or greater than 60 cm. The maximum brightness we’ve recorded in the center of the screen is 316 cd/m2 and 297 cd/m2 as average across the surface with a maximum deviation of 12% in the lower right corner of the panel. The color temperature is exactly 6500K making it optimal. The contrat ratio is 1040:1. The maximum dE2000 color deviation compared to the center is 2.8, which isn’t a bad result as values above 4.0 are usually unwanted. You can see how the results change when the screen is set to 140 cd/m2 or in other words at 72% brightness. 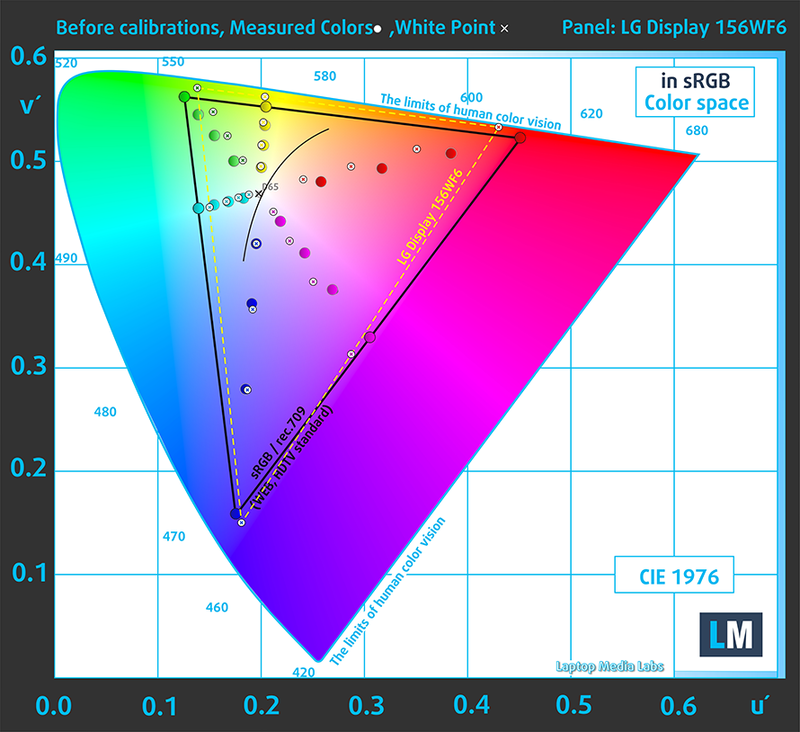 The panel covers 90% of the sRGB color gamut making it ideal for office work, web browsing and multimedia. However, due to the missing 10% of the sRGB color space, we can’t say it will satisfy every user when it comes to color sensitive work. The “Design and Gaming” profile is created at 140 cd/m2 brightness, D65 (6500K) white point and optimal gamma in sRGB mode. We recorded Fall Time + Rise Time = 24ms. As expected, the laptop’s screen flickers from 0 to 99% screen brightness and may put some strain on users with extra sensitive eyes. However, the high-frequency PWM reduces the negative effects. If you are planning on using the machine without an external display more often than not, we strongly encourage you to opt for the Full HD IPS version that we got because the panel presented here is pretty good. Not perfect, but really good. It’s good for office work, gaming, multimedia and browsing. 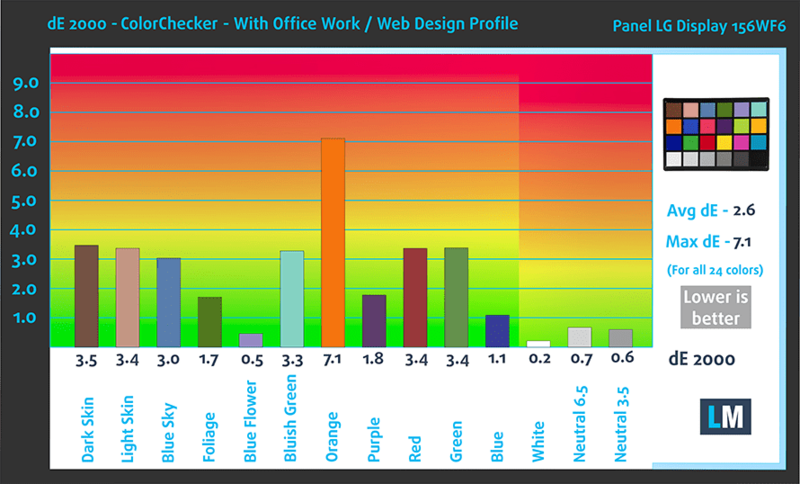 However, some users will find the 90% sRGB coverage insufficient for color-sensitive work on the go. In any case, the maximum brightness, contrast ratio, and viewing angles are more than fine. The only serious drawback of is the presence of PWM from 0 to 99% brightness, which can be eliminated by our Health-Guard profile. The other two profiles will also improve color accuracy and visibility in dark parts of an image/movie. So if you want the best possible experience out of the LG LP156WF6-SPP1, we strongly recommend purchasing our custom profiles. The sound quality of the loudspeakers is good – there’s enough clarity in the low, mid and high frequencies. 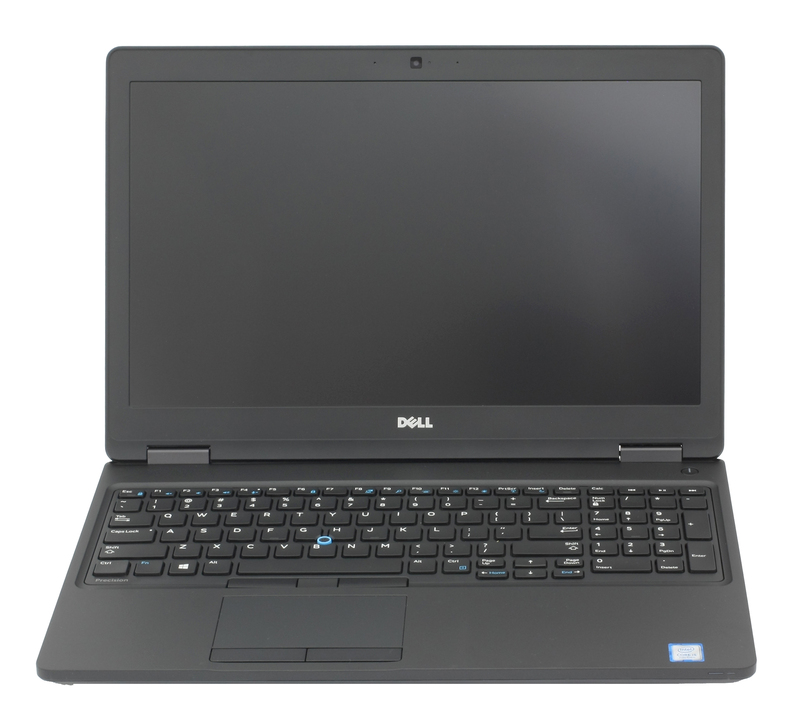 We used the pre-installed Windows 10 (64-bit) for the writing of this review but if you wish to perform a clean install of the OS without the bloatware, we suggest downloading all of the latest drivers from Dell’s official support page. 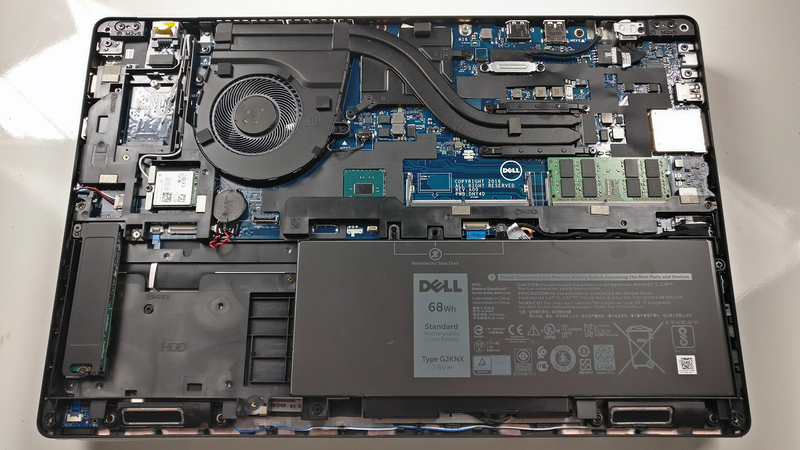 We were pretty surprised to see the Precision 3520 performing so well in our battery tests because, after all, the laptop sports a power-hungry quad-core Intel Core i5-7440HQ processor rated at 45W TDP and a 15-inch IPS panel. Instead, we see almost record-breaking browsing runtimes mainly thanks to the large 68Wh unit. So it turns out that not only does the notebook pack a serious horsepower under the hood but it can also run for hours without the need of charging it. We ran all the usual battery tests using the same conditions as always – Wi-Fi constantly running, screen brightness set to 120 cd/m2 and Windows battery saving feature turned on. Excellent battery performance – 700 minutes (11 hours and 40 minutes). Considerably lower but still an excellent result – 478 minutes (7 hours and 58 minutes). Of course, the laptop isn’t made for gaming but it’s good to know that it can last more than three hours under heavy load – 135 minutes (2 hours and 15 minutes). The Core i5-7440HQ is a processor based on Intel’s Kaby Lake microarchitecture featuring 14nm manufacturing process. It’s just like the Core i5-7300HQ but with slightly higher clock speeds (2.8 – 3.8 GHz) with 3.4 GHz being the maximum operating frequency with four active cores. Also, as a quad-core i5 chip, it doesn’t offer the much-needed Hyper-Threading technology so it falls behind its Core i7 alternatives. Anything other than that is practically the same – dual-channel memory controller supporting DDR3L-1600 and DDR4-2400, 45W TDP including the controller and Intel HD Graphic 630. However, unlike most mainstream processors, including the Core i5-7300HQ, the Core i5-7440HQ offers the so-called Intel vPro pack of features. This means that the chip supports some essential business-oriented features like Intel AMT, Intel TXT, Intel VT and more. Usually, the processor is found in high-end business-grade laptops with the appropriate cooling solution from 15-inch form factor and above. Here you can see an approximate comparison between the CPUs that can be found in the Dell Precision 15 3520 models on the market. 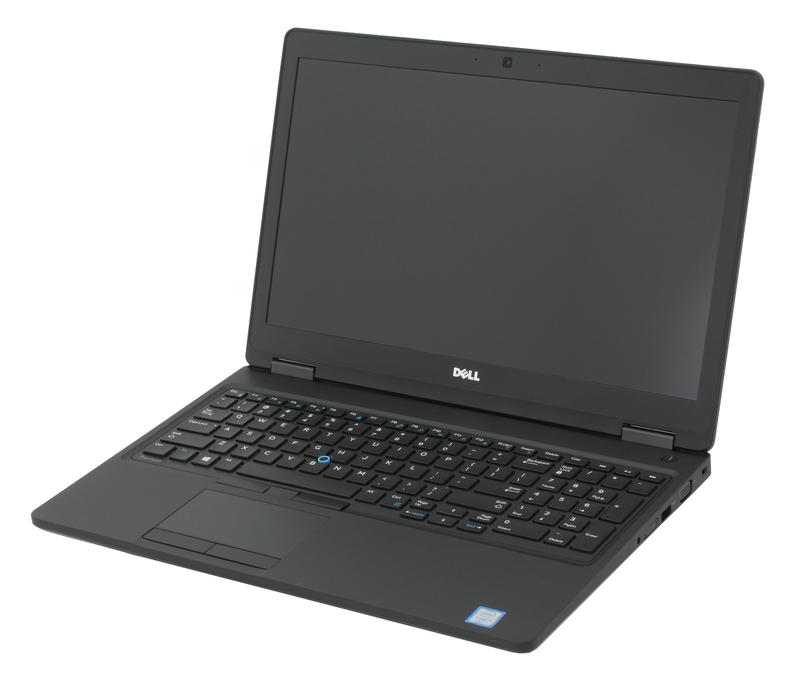 This way you can decide for yourself which Dell Precision 15 3520 model is the best bang for your buck. Fritz is a chess benchmark that tests the computing capabilities of the CPU with various chess moves. The Intel Core i5-7440HQ scored 10.373 million moves per second. In comparison, one of the most powerful chess computers, Deep(er) Blue, was able to squeeze out 200 million moves per second. In 1997 Deep(er) Blue even beat the famous Garry Kasparov with 3.5 to 2.5. The Quadro M620 is a professional-grade mobile graphics solution for mobile workstations supporting DirectX 12 and OpenGL 4.5. It’s based on the Maxwell architecture from NVIDIA and features 512 CUDA cores, 32 TMUs and 16 ROPs. It’s based on the GM107 chip built on the 28nm node from TSMC, which sports 640 shading units but, of course, some of them are disabled to reach the target count and it’s clocked at 977 MHz. 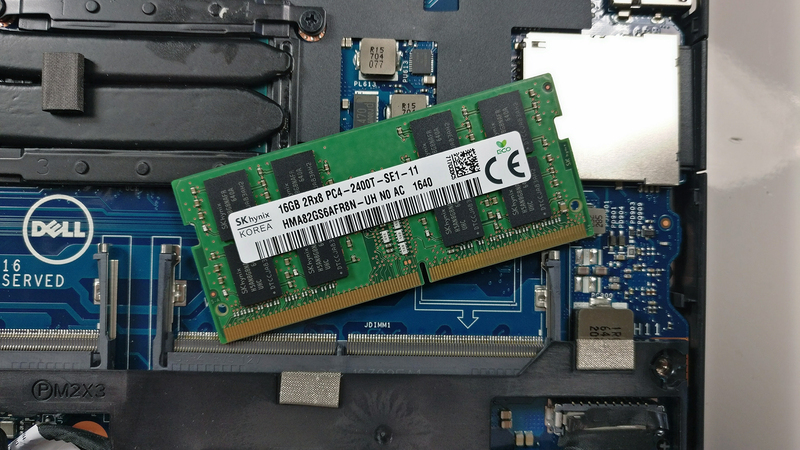 The memory configuration includes 2GB of GDDR5 VRAM on a 128-bit memory bus and it’s clocked at 1250 MHz while the TDP is believed to be around 30W. Obviously, the GPU isn’t a consumer-grade GPU for gaming, although the hardware supports it, instead, it’s optimized for CAD, DCC and CGI applications thanks to the special drivers made by NVIDIA. Here you can see an approximate comparison between the GPUs that can be found in the Dell Precision 15 3520 models on the market. This way you can decide for yourself which Dell Precision 15 3520 model is the best bang for your buck. The temperature tests that we perform are a little bit over the top because, in real-life use, the notebook doesn’t reach 100% CPU and 100% GPU load for such long periods of time. However, the stress tests are still the best way to assess the overall stability and effectiveness of the cooling system. 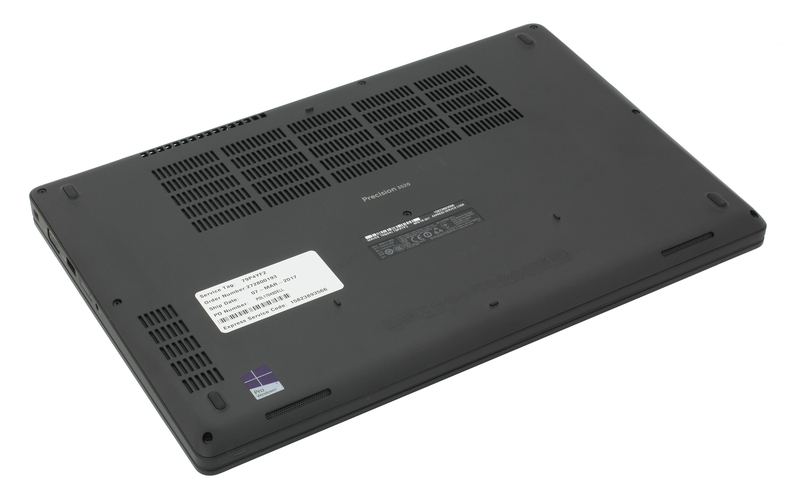 Especially in this case where the Precision 15 3520 is a mobile workstation that will have to get some serious work done on the go and presumably, will have to withstand some moderate to heavy workload. We started with 100% CPU load for an hour. The Core i5-7440HQ was able to reach its maximum operating frequency for four active cores (3.2 GHz) while maintaining relatively low temperatures. 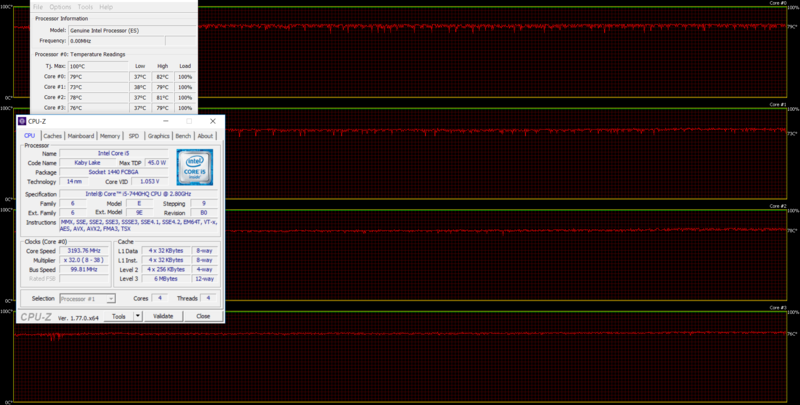 However, since the CPU and GPU share the same heat pipes, the GPU stress test made the CPU throttle. The Quadro M620 was also running way too hot and throttled as well. A dual cooling fan solution would have probably been more appropriate considering the TDP of both chips. Temperatures on the surface appeared to be relatively normal. The upper part of the keyboard got a little bit warm but we doubt that users will feel anything under normal circumstances. If you are reading this review, you are probably already considering this laptop as your next mobile workstation and you just need the confirmation. Apparently, you are into this line of work (engineering, 3D modeling, CGI animations, etc.) so you need the special hardware to work with CAD, DCC and CGI applications. 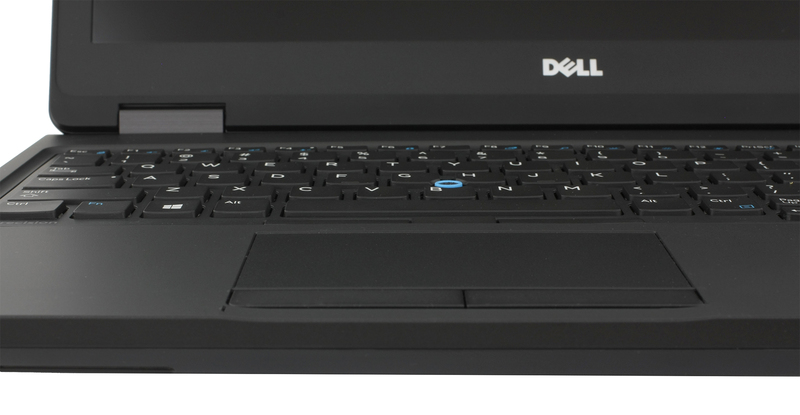 Well, we are happy to report that Dell’s Precision 15 3520 is a nice entry-level 15-inch workstation that will get the work done, although entry-level doesn’t mean affordable. Quite the opposite. As we already said, if you aren’t looking for a Quadro GPU, you are better off with similarly priced gaming laptops that pack considerably more power under the hood. 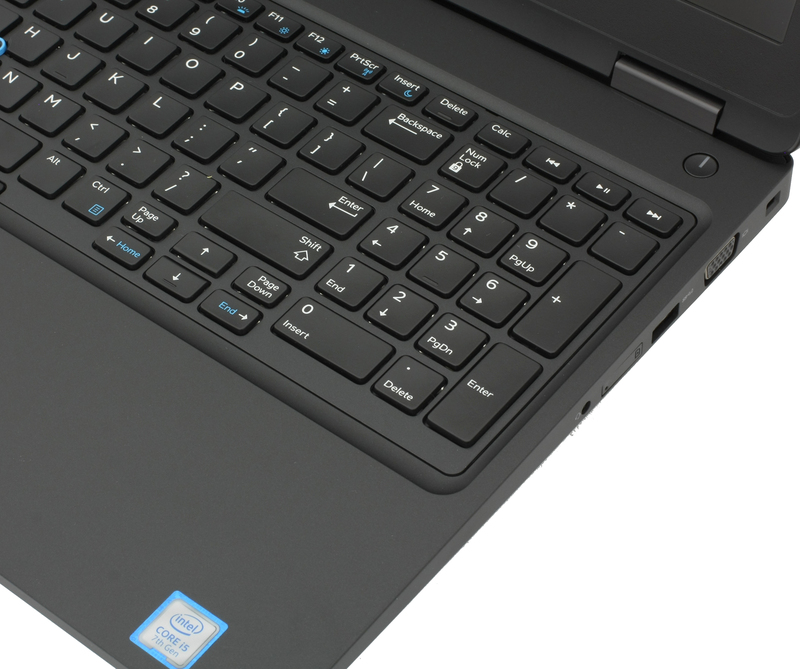 However, the Precision 3520 excels in all areas where those gaming notebooks fail. You get the strict, simplistic design with impeccable build quality, excellent input devices and surprisingly portable. Another thing that’s usually missing in all gaming laptops, especially in this price range, is the absolutely amazing battery life. The huge 68Wh unit just blew past its competition with ease. What fails to meet our expectations is the storage configuration and cooling system. You will have to choose between a standard 2.5-inch HDD/SSD or an M.2 SSD. The latter obstructs the 2.5-inch drive so investing in a high-capacity M.2 PCIe NVMe SSD is a must for most users. As for the cooling system, the stress tests speak for themselves – the unit wasn’t able to maintain normal temperatures under heavy workload on both chips and they thermal throttled. It probably isn’t something you would have problems with under normal circumstances but keep this in mind when purchasing the laptop. Finally, we will complain about the screen. Well, not about this particular model, though, as it has excellent IPS screen suitable for more than just office work and multimedia – it features high maximum brightness, high contrast, wide sRGB coverage but unfortunately has PWM from 0 to 99% brightness. The latter is taken care of by our Health-Guard profile. Anyway, the base model comes with a bad TN panel, which unacceptable given the price tag. So if you are willing to spend so much on a mobile workstation, we strongly recommend opting for the IPS configuration that we got.